Vengurla is a town in Indian state of Maharashtra. It is situated in Sindhudurga district of the state. It comes in the Kokan region and is adorned with lush green mountains, pristine beaches and beautiful natural surroundings. The town of Vengurla is also rich in cultural heritage. It was one of the busiest ports in the past and had also flourished in trade and business in those times. It is now a hot tourist spot as it houses many exquisite beaches and other beautiful natural sites. Mochemad beach near Vengurla offers the visitors beautiful long stretch of golden sand along the majestic Arabian Sea. You can see here fascinating Suru trees lined along shores of the Sea. 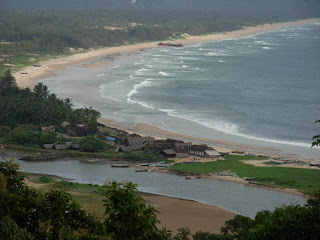 Some hills covered with lush green forest and cool and pleasant breeze of sea attract the tourist in large number there. Vayangani beach is another place of attraction to be seen in Vengurla. It is not only this beautiful beach that attracts the tourists, there are other picturesque natural sites that fascinates tourist most. Lush green trees of mango, Jackfruit, cashew etc are found in plenty all along the shores of the Arabian Sea. If you are on visit to this beautiful town don’t miss Kokan Farming University and Fruit Research Center. It is study centre and also serves as a tourist spot. Here you will get to see many varieties of Mango, Cashew and other fruits. The centre specializes in remolding and creating new species of fruits plants. Apart from natural beautiful sites Vengurla has some place of worships visited by many devotees and tourists as well. Among them is the temple of lord Shiva located near the Sangreshwar beach. The temple is built in stones and presents a grand look to the visitors. Ganesh temple, Shri Mauli temple and Swaymbhoo Mahadev temple are other religious places to be seen around Vengurla. These temples are situated in Redi village near Vengurla. Dabolim Airport of Goa serves as the nearest airbase to Vengurla. Goa is just 84 km away from it and is well liked to other major cities of the country. Many state run buses connect Vengurla to Pune, Mumbai, Goa and other cities and towns of Maharashtra and Goa. Kudal railway station which serves as the closest railhead comes in Kokan railway line and is connected to other cities and towns of the state.